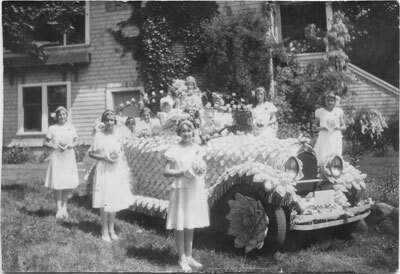 View of second May Queens Car, May 1931. Car is surrounded by attendants. Location appears to be W.C. Thompson House at 2058 Argyle Avenue. Scanned December 2011 using Epson Perfection V700 Photo at 300dpi and 100% of original image size. Alternate Versions: Lossless TIF from original scan at 300dpi and 100% of original print. W17 x H12 cm black & white print on photo paper.